Planting new seeds. The Schwartz family hosted a little homecoming BBQ in the spring with Matt. He brought goodies. Matt back in the day in his happy place, the oven station at MGFD rocking a brunch tortilla. The prolific marriage of inspiration and efficiency can’t be found in the vacuum of one dish alone. It’s the full circle approach where sourcing is king that Michael lives by, and that produces the kind of menu that makes sense. You know it because it defines Michael’s Genuine®. This too speaks to nature of the talent that is drawn to work in our restaurant and comprise a team that will practice it every day. A simple way to guarantee action, that this idea actually plays out, is by bringing ingredients in WHOLE… to work with everything, and in that, know where they were raised, how and by whom. It’s a built in way to keep us honest and a tool for cultivating this culture in the kitchen both for veterans and newcomers. Today we celebrate the whole big picture, which when we are lucky, extends to those who have moved on from the seed of Genuine to sew their own. Like Chef Matt Hinckley. Matt’s Orlando-based operation, Hinckley’s Fancy Meats is taking a next big step to completing its own circle. He has secured approval by the Florida Dept of Agriculture and Consumer Services (FDACS) as a Retail Meat Market and is putting the systems in place to begin shipping his nose-to-tail, sustainably-sourced products — with a focus on charcuterie made with heritage hog breeds that are responsibly-raised on small farms in Florida — nationwide. Click here to support his Kickstarter campaign, which went live this morning. You have 29 more days to donate for one-of-a-kind opportunities like a Michael’s Genuine Trunk Show when Matt returns to the wood oven at Michael’s Genuine Food & Drink for one night only. Hinckley’s Fancy Meats will have a pop-up trunk show with a sneak peek at what you can expect in the mail. $100 guarantees you a reservation, a menu signed by the whole team, and a pound of Hinckley’s Fancy Bacon. But what of that $7,500 or more pledge for a Caja China Superbowl Fiesta wherein he sources a sustainably-raised 60-70 lb. heritage breed pig from a small, independent Florida farm and roasts it whole for you and up to 60 of your closest friends at your 2018 Superbowl party!? Butcher’s block and a bunch of condiments, service right off the coals, included. Hinckley’s Fancy Meats’ tasso ham on my home cutting board. Words to live by, then and now. MGFD circa 2010, not much has changed. Matt in back with forager and Bradley as CDC up front. For me, Matt was always the resident food anthropologist during his tenure as Sous Chef at Michael’s Genuine® Food & Drink from 2009-2011 (and later opening chef of the original Harry’s Pizzeria®.) Thanks to Matt, Lamb stew would become something way more than an aromatic pot of goodness. It was a trip not just to Africa, but specifically Morocco in the cous cous and Ethiopia in the awaze. His dedication to knowledge has been transportive, taking him around the world and bringing it to the table for all of us to enjoy. In a December 2010 post on The Genuine Kitchen, he wrote of our pasta program and how it expressed what MGFD was all about — a perfect canvas for cross utilizing product and using different parts of one animal, like a whole pig. “Food tastes better when you are in touch with the source,” he would explain, and as such cooking begins long before ingredients are in the kitchen. This is Hinckley’s Fancy Meats’ rallying cry, providing fresh cuts of meat as well as various types of charcuterie and smoked meats. Popular signature items thus far have been Tasso Ham, Hinckley’s Fancy Bacon, Florida Ham, Grass-fed Pastrami, Breakfast Sausage, and Andouille. Matt makes seasonal creations and limited runs, a nose-to-tail butcher shop, but with plenty of familiar offerings as well, crafted with the home cook in mind. The funding will help Hinckley’s Fancy Meats purchase the necessary equipment and supplies to expand its business model and steward the mission. By offering shipping and delivery, Matt will be able to drastically expand his market and work toward making a better and more transparent food system. It’s about opening access for the home cook to have access to the same quality ingredients that chefs use in the best restaurants in the country. We can all get behind that. Did Someone Say Super Porkwich? Game On! 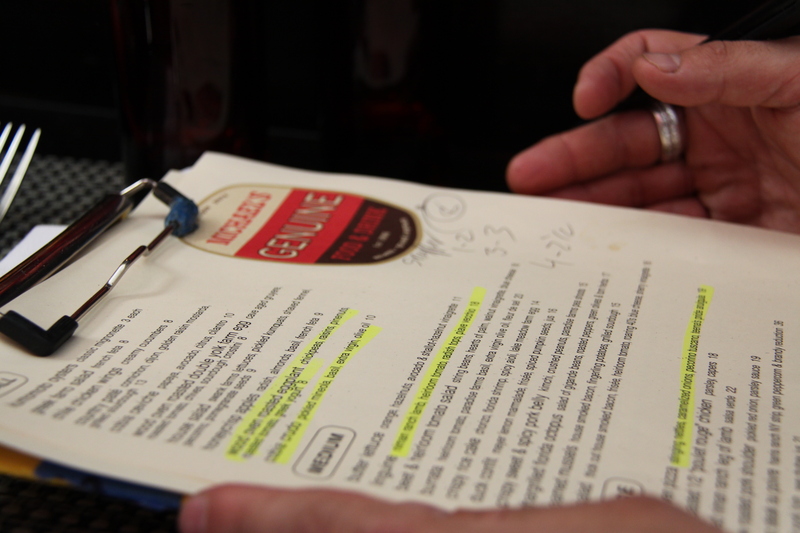 Chef de Cuisine Bradley Herron's daily game plan. Later today, Hedy, Michael, and Bradley plus the peanut gallery of yours truly and Ellie, will get our pork on as the strategy talks continue for our offerings at Cochon 555, coming to Miami for the first time on April 1. See New York’s recent winner here, and stay tuned to the competition’s website for the announcement of our competitors and ticket sales. Of course it’s only fair that, in honor of the more imminent pigskin faceoff known as the Super Bowl, we share our winning game day pork recipe for your use at home. I tested this puppy, a new one from Bradley’s arsenal including past winners like Honeycrisp Apple Salad, and it is as easy to prepare as it is delicious. I used a standard, but no less delicious, ground shoulder from Publix, but you could get fancy with heritage meat if you can find it, like we get for the restaurant from Jim Wood at Palmetto Creek Farms. Try your hand — two are preferable — for a mid-game meal this Superbowl Sunday, and let us know what you think and send us a photo. Mine was gone before I could snap one! 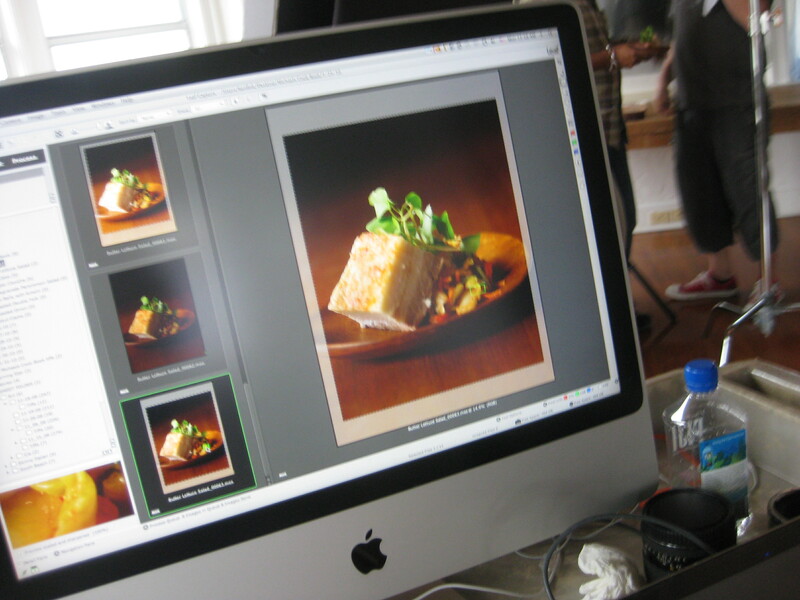 100% Berkshire pork is the star of crispy sweet & spicy pork belly, here getting ready for its close-up at the cookbook photo shoot in January. Where can I find Berkshire pork locally without having to place an order online? Great question Carla. You can get pork from heritage breeds like Berkshire here in Miami, but if you walked into a store today, you’re not going find it. Let’s quickly back up for some context as to why… Heritage means old breeds that have become rare thanks to industrial hog farming. Heritage hog farmers have small, often family-run operations so it’s no wonder you might have difficultly finding it at your neighborhood grocer.